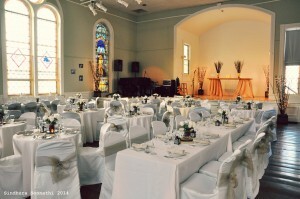 Rent our charming historic hall and art gallery – a unique event venue for celebrations and ceremonies including birthdays, music recitals, anniversaries, and weddings. We even have a full kitchen and a gallery room to serve your hungry guests. We welcome outside catering and bartending services at no additional cost. Review our rental policies below. Choose from either the first or second floor. Includes the main hall, gallery and the kitchen. You’ll also have the use of 14 3-foot round party tables, 10 6-foot banquet tables, and 100+ chairs. 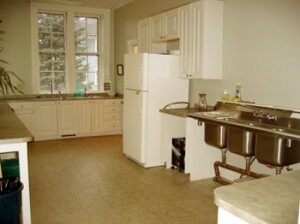 The kitchen comes equipped with an oven, microwave, and refrigerator. Steinway B grand piano rented separately. Renters supply their own glassware, plates, linens, and utensils. Our largest and most versatile space, approximately 1575 square feet with a 100 to 125 seating capacity depending on the number of tables set up. Our Steinway B grand piano that sits on the stage is also available to rent. Perfect for a variety of entertainment events, with lots of light streaming in from the stained glass windows. The art adorning the walls from our featured Artist of the Month adds an unexpected and unique touch. The gallery is a multi-purpose room off the main hall. Often used to serve food and drinks, or as a hangout for musicians and guests. As with the main hall, the walls are usually decorated with art by our Artist of the Month, adding an elegant ambiance to the room. A sliding door allows the gallery to be closed off from the main hall, preventing any disturbance to performances. Included with every first floor rental. The spacious kitchen is complete with an oven, microwave, refrigerator and freezer. Included with every first floor rental. 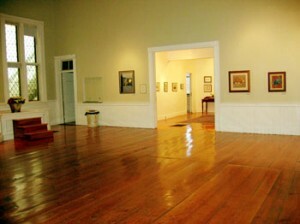 Provides direct access to both the gallery and main hall. 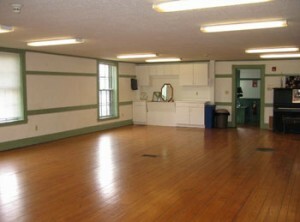 The 2nd floor hall is generally used for teaching classes but is also available for rental. It includes tables, chairs and a sink (but no other kitchen facilities). Approximately 1035 square feet and can accommodate approximately 25-30 people. This room includes a sink and counter area. No kitchen facilities are available. *Renters pay for entire time using the space including setup and cleanup time. The PCA does not have a maintenance crew. Renters setup any chairs, tables, etc. and clean up afterward including trash removal, sweeping crumbs off the floor, etc. Renters pay for both setup and cleanup time. Once a date/time is agreed upon, the renter receives a contract that they sign and return with payment. Several days prior to the rental, the renter receives a key and a brief building orientation at a mutually agreed upon time. Once the PCA has received a signed contract and payment, the following cancellation policies apply. more than 30 days in advance of the rental date – 100% refund minus a $25 administrative fee. **if the PCA is able to re-rent the building, then 100% refund minus a $25 administrative fee. The PCA has 14 three foot round tables, 10 six foot rectangular banquet tables, 2 eight foot rectangular banquet tables and over 100 chairs. The first floor has a kitchen with an oven, refrigerator, and microwave. Renters must provide their own tablecloths if desired. The PCA provides toilet paper, paper towels, and trash bags. All other paper goods, dish towels, utensils, platters, etc. are the responsibility of the renter. The PCA does not have air conditioning. The windows in the main hall are stained glass and cannot be opened. 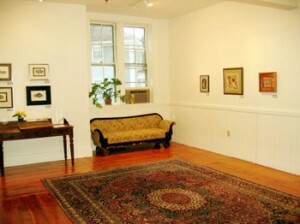 In addition, no artwork is on the walls during the summer months. For these reasons, we do not rent the hall during the summer. First floor renters have full use of the kitchen during their rental hours. Renters holding events open to the public or charging an admission fee require a food permit from the Westford Board of Health. In addition, caterers must register with the Westford Board of Health. The PCA does not have an “approved list of caterers” although we can recommend caterers if requested. For adult rentals, alcohol can be served (responsibly) once permission is obtained from the Board of Directors. Renters holding events open to the public and/or wishing to sell alcohol during their event must obtain a one-day license from the Town of Westford and follow all applicable laws in accordance with the Commonwealth of Massachusetts. Renters may hire a band or DJ to perform at their function. Because the PCA is located in a residential neighborhood, all music must stop by 11 p.m. on weekends and 10 p.m. on weeknights. Out of respect for our residential neighbors, please exit the building quietly at the end of your function. Fog machines cannot be used as the PCA fire alarm system will sound. See additional rules for renters under age 25. Decorations are allowed, however, must be completely removed at the conclusion of the contracted time period. Push pins are preferable over tape which can leave a sticky residue or can damage the painted walls or woodwork. Temporary, stick-on hooks, duct tape, and nails are not allowed. The PCA does not have a parking lot. Free parking is available in the surrounding area. Direct your guests to our Location page for parking details. Patrons may park along both sides of Lincoln Street, in front of the library on Main Street as well as along Connell Drive. If the library and/or town hall is closed, parking is available in their parking lots. Designated parking spaces are available in the fire station lot on weekends, holidays, and weekdays after 4 pm. Parking at the Westford Museum is by permission only…please call 978-692-5550 to speak with the Museum Director. Parking in the Connolly Insurance Co. driveway is prohibited at all times. NOTE: The Town of Westford enforces a Winter Parking Ban so street parking may be restricted during winter months. Contact the Westford Police for details at 978-692-2161. A parent must take responsibility for the rental. The responsible parent signs the contract and must be in the building for the entire duration of the rental period. The parent ensures a 1:10 parent:teen chaperone ratio for the event. Westford police must be hired for the duration of the event by calling 978-692-2161. The police normally direct traffic outside the building as parents drop off/pick up their children. Teens must provide their own sound equipment if desired. Music must stop by 10:30 p.m.